I was shocked to learn today that Animals Asia’s Vietnam Bear Rescue Center is facing eviction and relocation. Animals Asia is a nonprofit dedicated to ending the barbaric practice of bear bile farming and improving the welfare of animals in China and Vietnam. According to the group’s founder, Jill Robinson, Vietnam’s Ministry of Agriculture and Rural Development handed Animals Asia an official eviction notice on October 5 stating that their bear sanctuary had to leave Tam Dao National Park, where the ursine haven is home to 104 bears rescued from the bear-bile trade. The park director has been pressuring Animals Asia to relinquish six hectares of land since April 2011. The eviction is in direct violation of the Vietnam government’s 2005 agreement with Animals Asia to fund and develop a facility on 12 hectares of the park that would permanently rehabilitate and house 200 endangered bears rescued from the illegal bear-bile industry. Based on this agreement, Animals Asia has invested more than US$2 million in building and infrastructure. There are more than 10,000 bears — mainly moon bears, but also others such as Malayan sun bears and brown bears — kept on bile farms in China, and about 2,400 in Vietnam. For up to 30 years, the animals are “milked” regularly for their bile, which is stored in the gall bladder. The bile is used as a form of medicine, even though many herbal and synthetic alternatives are available. Starved, dehydrated and riddled with ailments, the bears suffer a living hell. Animals Asia is working to end this horrific torment. 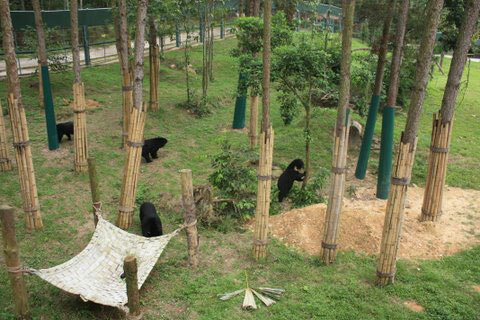 Bears recovering at Animals Asia in Vietnam. I have been a big fan and supporter of Animals Asia for years, and Jill Robinson has been a patient and invaluable resource as I’ve developed my next book, which focuses on animal cruelties. I urge animal advocates everywhere to speak up for this sanctuary and the remarkable work Animals Asia is doing. Animals Asia is calling on the public in Vietnam and internationally to write to the Prime Minister of Vietnam and appeal for him to allow the Vietnam Bear Rescue Center that he previously approved and endorsed to continue operations, and expand, in line with the government’s original agreement. Details can be found on Animals Asia’s website here. I write to express my concern that Animals Asia’s world-class bear sanctuary is to be evicted from Tam Dao National Park by the Ministry of Defense. The eviction is in direct violation of the Vietnam government’s agreement with Animals Asia, to develop a rescue centre on 12 hectares of the park that would permanently rehabilitate and house 200 endangered bears rescued from the illegal bear bile industry. The closure would see 104 rescued bears evicted, 77 Vietnamese staff lose their jobs, and financial losses to Animals Asia of more than US$2 million. Please overturn the decision to evict Animals Asia and honor your government’s agreement. Step 2: Sign this petition. Step 3: Share this post on Facebook and Twitter. Update: As of January 2013, Animals Asia is reporting that the government of Vietnam has reversed course and is allowing the sanctuary to remain. Thanks to everyone who took the time to speak up for the bears!